The ancient church of St Benedict stands on the course of the Pilgrim's Way and was probably used by many thousands of medieval pilgrims on their way to Canterbury. The church is set beside a farm, and indeed, from 1678 it was used as a farm building. It was only in the 20th century that St Benedict's was restored and open to the public as a historic church. The isolated position of the church suggests that St Benedict's originally served a village that was wiped out in the Black Death of 1348. 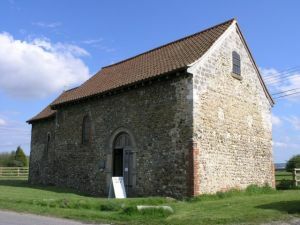 Sections of stonework may belong to the Saxon period, but the body of the church is very Norman, consisting of a simple nave and chancel, with a round-headed north door. There is a very small west window and a similarly small window on the north wall of the nave and chancel. NB. Do not confuse St Benedicts with the other historic church in Paddlesworth parish, St Oswalds (which is also well worth a visit! ).